← Referendums: A Legitimate Democratic Tool or a Mechanism for Nationalist Co-optation? 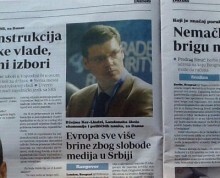 London, Belgrade – It has become apparent that there is an escalating concern in Europe about the state of media freedom in Serbia, and there is the impression that this issue will most likely be included in the next European Commission progress report on Serbia’s EU accession. It is important to note that the issue of media freedom was also raised by the Organisation for Security and Co-operation in Europe (OSCE). The election reports prepared by the OSCE carry their weight on the annual European Commission reports. 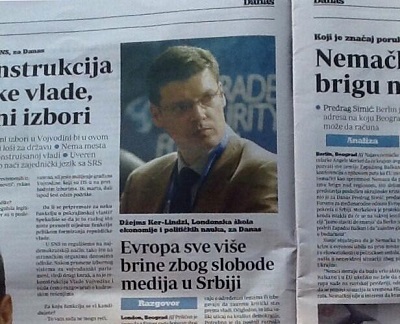 “It is clear that the concern about media freedom was one of the issues which have affected the recent elections in Serbia”, LSEE senior researcher James Ker-Lindsay told Danas, while commenting on the alleged cases on media censorship in Serbia. Ker-Lindsay points out that it is worthwhile to remember that media freedom is a more complex matter than the attempt of evaluating whether the government is taking any steps against the print and online media outlets criticising its positions. “We must not forget the issue of self-censorship. There is the feeling that many Serbian media outlets are deciding on purpose not to report on specific topics, or are choosing not to take a critical stand against the government. This clearly has a big influence on the advancement of democracy. In a fully functional democratic system it is necessary for a varied spectrum of views to co-exist. This is of course not to say that all media need to be neutral or non-partisan. Even though some papers might wish to be on the side of the government, there should never be the feeling that the rest of the media need to be afraid of criticising the government’s actions or to support the opposition if that is what they deem the right thing to do”, assesses the LSEE expert. Ker-Lindsay says that it is not a good sign to be voicing conspiracy claims when confronted with criticism coming from the EU and the OSCE. “First of all, this is not the way the EU and the OSCE work. Second, EU members get a very negative message out of this reaction, as it is often interpreted as a sign that the government not only has problems accepting criticism, but that it also does not want to respond to it. Third, resorting to conspiracy theories is seen as a proof of a leader’s instability, in the same way as done by Erdogan in Turkey. The last thing Serbia needs to do is to show an hostile attitude towards the EU, be it in a direct or indirect way”, he says. James Ker-Lindsay points out that it must not be forgotten that the EU can stop accession talks with a candidate country at any time. “It is better to accept criticism and respond to it point by point in a calm, rational and constructive way”, says Ker-Lindsay. This entry was posted in Serbia and tagged EU accession, EU enlargement, European Union, James Ker-Lindsay, media control, media freedom, OSCE, Serbia. Bookmark the permalink.